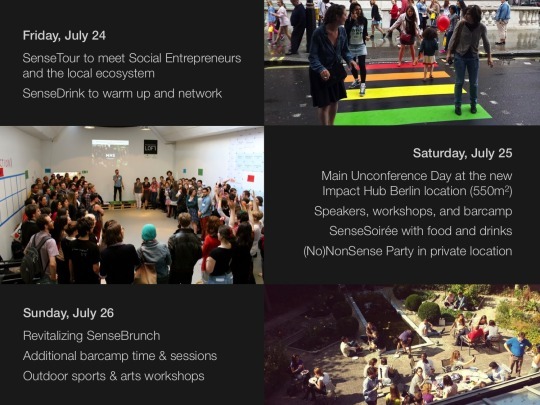 SenseCamp is coming home: One year after we launched the first event, we’re doing it again: SenseCamp Berlin 2013! SenseCamp is a barcamp dedicated to social entrepreneurship: It brings together social entrepreneurs, social business enthusiasts and the MakeSense gang for one full day of inspiring talks, interactive workshops and networking. A barcamp is a community-driven event where the agenda is set by the participants. To host a session, anybody can pitch a topic in the morning planning meeting. The format’s flexibility allows conversations to continue, intensify or refocus as needed by the participants. It blurs traditional notions of speakers and listeners and creates a highly interactive experience of shared learning and development. The SenseCamp is also unique chance to experience the MakeSense Hold-Up format of innovation workshops for social entrepreneurs. Whether you are a seasoned social entrepreneur or simply interested in the topic, we are building a place to discover and exchange new ideas, actionable insights and success/failure stories. In the evening, there’s also the NonSense party where you can shake out some moves! Believe it or not – Social Business rules the World! You better join us on February 9! nice appearance by the always-amazing naomi klein on bill moyers. 30 min worth watching. i love her analysis of most climate activist messages that target the individual (‘you can do something about it by changing your behavior’) and often neglect the necessity for collective action. this point is the reason i finally became a fan of annie leonard’s story of stuff series when she presented the story of change, and what i love about occupy movement: the realization that we need to break out of the individualistic thinking that keeps us competing against each other rather than working together. we’re all in the same boat and should start acting more like it. i’m mostly contemplating her point that part of the reason why public opinion on the subject of climate change has been so shaky is the discrepancy between saying ‘this is a huge, armageddon-style problem’ but suggesting that the solutions only have a very minor impact on our lives (‘changing light bulbs’) and do not demand big sacrifices from anyone. maybe it’s because ‘being radical’ has been put in such a bad public light, and the public debate tends to frame climate activists as radical – while it’s actually the other way round, as mckibben so rightly points out: the true radicals are those who are fundamentally changing the composition of the atmosphere. i’m no historian, but i do tend to agree with her (as i usually do..) that this is the greatest problem we’ve ever faced as humanity. it’s what makes this the most interesting issue to work on and be a part of. by the way, also just in: 350.org is calling climate activists around the world to join the global power shift kick-off in istanbul from 10-17 june 2013. i’m hoping i can join, and look forward to meet climate activists from around the world! Official Promo Video for the Silent Climate Parade 2012! This year, we’ll dance to the beats from these DJs: Jake The Rapper (Bar 25), NU (Bar 25), Blenn&Gleich (Plastik Park), Viperflo (Keller). Please support our crowdfunding campaign via betterplace, either with a contribution or a share/like/report/retweet etc.! the silent climate parade will roll again through berlin this september! remember, when we danced through berlin to demonstrate (for) a sustainable future? if not, read the description below to get and idea of what we’re all about! and check out the 2011 video (thx, laurent!) & the website! the plan for 2012: on september 22, we’ll start the parade around alexanderplatz. get your headphones between 12-2pm, and then the parade will dance silently through east berlin from 2-5pm. we’re in the midst of organizing, so stay tuned via the fb event! but we need your support: we’re crowdfunding via betterplace to make this day possible again. can you help us to organize the best silent climate parade ever? The Silent Climate Parade is a demonstration in Berlin to raise awareness about the failure to solve the climate change problem. With wireless headphones, quality DJs on electromobiles, signs, flyers, choreographies, and lots of enthusiasm, we dance silently through the streets in a fun, colorful and inspiring action to catch people’s attention. We do this to show that it’s possible to have fun, be climate friendly, and make a political statement at the same time. Let’s get moving! https://www.projecthires.com/wp-content/uploads/2018/10/logo_web_small-1.png 0 0 dh https://www.projecthires.com/wp-content/uploads/2018/10/logo_web_small-1.png dh2012-05-04 18:50:592012-05-04 18:50:59time to connect the dots! tomorrow on saturday, may 5, the silent climate parade joins forces with tar sands activists in berlin to protest against the catastrophic environmental destruction shown in this shocking (but great) video! looking forward to TEDxChange in berlin on thursday! today is world water day! one day out of the year to talk about the massive water, sanitation and hygiene crisis that kills 4000 children every day. that’s more than HIV, malaria, and measles combined! the entire week, more than 360,000 people are joining walks for water to bring attention to this major environmental and health issue. if you’re in berlin, you can join us at 15:00 (fb event)!